Why should I book a trip with Classic Alaska Charters? 80% of our clients are repeats or referrals! Several groups are more than 10 years in a row and counting. Joe and Harriet H. 17 years in a row! Mike S. 18 years only missing 2 seasons, and 2014 we welcome back aboard Dave Q., one of our very first charter group members that adventured with CAC during our inaugural year of 1990. This is is just another authentic testament to the enduring consistency and professionalism of our wilderness charter service, loyal repeat clients that make it back with us year after year and since the beginning of our business launch. Our remote adventure trips take you far from the typical cruise ship tourist scenes in town. CAC explores the spectacular wilderness areas where few people venture, where lodge boats don’t go, and where you will likely not see another human being or boat other than the group your with and the Saltery “C”. We qualify and carry the necessary special use permits for our shore excursions as required by the US Forest Service. The extended overnight capability of the Saltery C allows us to spend 100% of your valuable vacation time exploring, fishing or relaxing in pristine secluded waters NOT stuck in a lodge situation fishing from 8 AM – 5 PM, wasting time traveling back and forth from the crowded fishing grounds and spending evenings bored in your hotel room or the lodge lounge. With Classic Alaska Charters you will experience the solitude and magic of the real Alaska away from the crowds. We consult directly with you as to your particular interests and design a vacation around you! We have the ability to modify a trip in progress to take in more of a particular activity that you may be enjoying or explore other opportunities that might interest you! Your host and guide, Captain Rob has fifty years of wide ranging fishing experience, from Florida to Alaska, Mexico to Wisconsin and many places in between. Background and college education in resource management and fisheries along with a stint with the US Forest Service in Alaska has formally prepared Captain Rob with the knowledge and wisdom others in the charter business may fall short with. What is the weather and seas like in the summer? Climate is similar to the Pacific Northwest with mild winters and lots of rain. Summer high temperatures average between 50-70 F and lows from 40-60 degrees. Rain is likely at anytime but has never kept us from having fun and keeping up with our agenda. Overall, aside from the rain, the weather is really spectacular from May-Sept.
Because most of our adventures take us into protected waterways, we enjoy calm waters almost the entire adventure and we anchor in secluded coves during the evenings and those rare summer storms. Folks who tend to be seasick on the water will generally do very well on a trip with CAC! Dramamine is recommended, but hardly used, and the sea bands (wrist bands) for sea sickness seem to work really well for folks when we encounter the rare rough weather! Outside waters fishing is recommended for only the hardiest of fishermen with the understanding that this phenomenal fishing opportunity is located near open ocean, and seas can be a factor in the fishability of certain areas. Check with your doctor if you know you’re prone to seasickness and go by his recommendations for your trip. One of the most FAQ “frequently asked questions” Check here for the 7 day weather forecast for the Ketchikan area. How should we dress for a trip? Summer temperatures are cool but can change quickly, either way, hot or cold so dress in layers, T-shirts, flannels, then sweatshirts and a light jacket. Folks can always “peel” off a layer or two to enjoy the sunshine and remain comfortable. Buy or bring your own rain gear! CAC does not provide rain gear! Blue jeans or other comfortable slacks are typical for hiking and exploring activities, while sweat pants and sweatshirts are great for all boat activities, or “inactivities”. Tennis shoes or waterproof deck/boat shoes are about the only thing to wear on a boat. When going ashore, calf-high rubber boots are the best. We recommend “XtraTuf” boots for on and off the boat! Great for hiking too! Called “Ketchikan Sneakers” they’re the perfect footwear for the Southeast Alaska environment. Buy online at XtraTuf.com or buy locally in Ketchikan at Tongass Trading Co. when you arrive and before they close on Sunday eve usually around 5:30 pm. We do not provide them. CAC recommends the 16 inch, non-insulated plain toe boot for those planning on hiking. For those folks planning on being just on and around the boat we recommend the low rise Alaska Sneaker. Of course, if you have your own comparable type shoe or boot for wet fishing or hiking conditions, by all means bring them. What else do we bring? Bring your camera and video equipment (chargers too!) and plenty of memory cards for your equipment, along with the video and audio cables to hook up to the main salon flat screen TV for evening viewing. Besides all the fishing action, you will want to photographic the bald eagles, bears, marine mammals and other wildlife you may encounter. Bring sunglasses, binoculars, a hat, gloves, and your personal toiletry kit. Although mosquitoes and other insects are not bad in this area, you may want to bring a small bottle of repellent with you. Also, bring your sleeping bag! We provide pillows and clean pillowcases and an extra blanket, but you must provide, buy, or bring, your own sleeping bag. Walmart and Tongass Trading in Ketchikan have sleeping bags for less than $20 if you want to buy them in Ketchikan. For those planning on freshwater fishing bring your favorite “new or recently serviced” freshwater fishing rod n reel with fresh line spooled on. Fly rod fisherman, we recommend bringing your own as well. We do have “back-up” spinning rods n reels, fly rods n flies, etc too, in case of breakage or loss of your personal gear. Can we take fish home with us? Absolutely! Normally guests return home with 40-50 pounds of freshly frozen fish per person! Usually you can take one 50 lb. fish box per person as checked baggage for about $25. It will be an additional $25 for each 50 lb. fish box as checked baggage. If you would like your fish shipped to your door instead we can arrange shipping with Frontier Shipping to be expedited via Fed-Ex to receive at your convenience. The cost is quite a bit more but sometimes worth it. Silver Lining Seafoods was the only processor we recommended in Ketchikan for smoking, canning, and shipping fish for our customers. They were bought out by Trident Seafoods and the “custom processing” division was discontinued. We tried the “other” smokehouse in Ketchikan and were very, very disappointed in the quality and service. Even if you don’t book with CAC, don’t let any processing company in Ketchikan touch your precious fish catch. Take my word for it…you’ll have much better luck having your catch smoked at your local smokehouse wherever YOU live. What airlines should we choose for our trip? Alaska Airlines is the ONLY airlines that flies into Ketchikan International Airport (KTN). The flight is only 90 minutes from SEA-TAC airport just south of Seattle. For discounts and companion fares to make the flight costs a bit more bearable, consider signing up for an Alaska Airlines Visa Signature card. Check and see if the card benefits are right for you. What are the fishing regulations for the Ketchikan Area? Southeast Alaska Sport Fishing Regulations Summary Booklet. Southeast Alaska “General” Saltwater regulations. Southeast Alaska Ketchikan Area “Special” Freshwater and Saltwater regulations. Emergency Orders and News Releases. Federal Halibut Regulations 2014 for Southeast Alaska (Ketchikan Area 2C). Do I need an Alaska fishing license? Yes! Anyone over the age of 16 needs to have an Alaska fishing license in their possession when fishing AND transporting their catch! Kids under 16 years old need only to have some form of a “Field Harvest Ticket”…basically a piece of paper to record restricted annual harvest species such as king salmon, ling cod, and yelloweye. No worries, we have the necessary paperwork on board the Saltery “C”. We at CAC do NOT issue Alaska Fishing Licenses!!! You must purchase them online prior to your arrival or immediately upon your arrival in Ketchikan and certainly prior to leaving on your charter! Safeway, Walmart, Tongass Trading, sell the fishing licenses and are conveniently located near any hotel and just a couple of minutes from the harbor where you’ll board the Saltery “C”. *We recommend the 7-day sport fishing license to begin on Monday 8:00 am of your trip with CAC to be good for the duration of your adventure with us. There is no 5-day sport fishing license, and a 3-day sport fishing license will not cover the 5 day trip. If you intend to fish for and retain king salmon you’ll need a king salmon stamp! *We recommend at least the 3 day non-resident king salmon stamp, but encourage the 7 day non-resident king salmon stamp to cover those 2 other days on a trip with us when you would most likely hook the big one! Will there be cellphone or internet service while on board during a trip? Yes, and No… Cellphone service will be available on Mon until about Noon-1:00 pm depending on weather and our itinerary. Generally after that there is no reception until Friday when we get closer to Ketchikan. We do have a satellite phone for emergency use only. There is no internet service on board once we leave the dock other than your smartphone or wireless service, and then only for a short while. Most folks are happy to shut down their electronics for the duration for the trip…and always glad they did. Do you allow smoking on the Saltery “C”? Smoking is prohibited inside the vessel, no exceptions. The designated area for smokers that must light up is on the back deck away from open windows. How Can I Tell If A Charterboat is Legally Registered With ADF&G? Look at a side view of the charter vessel the company illustrates on their website or brochure and look for a green oval sticker prominently displayed. If not displayed, they are not registered with Alaska Dept of Fish and Game for saltwater or freshwater fishing! Don’t be fooled by charter companies that are vague and contradictory about the services they offer. Often, they attempt to operate under the radar without the required permits and registrations. If it appears like a questionable situation call the Alaska Dept of Fish & Game or US Forest Service in the city the charter company is based and ask if they are registered/permitted guide/charter operation. If you witness guides or charter companies involved in any type of illegal activity, violations of Alaska Fish & Game laws, or you are suspicious that the charter operation isn’t fully licensed, insured, or worse case scenario, a scam, report them immediately to the nearest Dept of Fish & Game Office. What does the vessel name Saltery “C” mean? The previous owner named the vessel and Captain Rob chose to keep it. It refer’s to a “cove” on Prince of Wales Island that was the location of a large “saltery” in the late 1800’s. In the days predating canneries the only way to preserve commercially caught fish was to “salt” or “dry” the fish. Those operations were called “Saltery’s”, and the Straits Packing Company located in a protected “cove” where the previous owner had purchased property, now named, Saltery Cove. 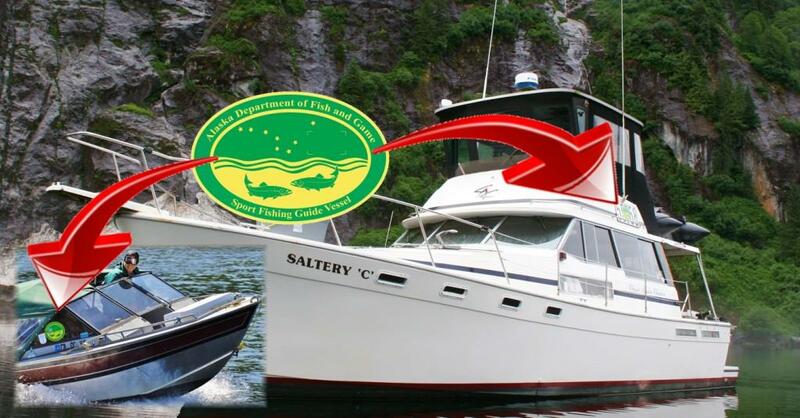 He chose to name the boat after the cove, shortened the “cove” to “C”, and now forevermore our vessel is known as the Saltery “C”. Does CAC do Sportsman’s Shows in the Lower 48 during the off-season? The short answer is no. We have a strong list of loyal ambassador’s and repeat clientele, that, between the 2 groups, make up 80% of our guests each season. We thought about doing shows several years ago, researched the cost and logistics and found doing any number of Sportsman’s Show’s down south requires substantial funding. The marketing cost of that sort of program would obviously be passed onto the sportsmen that book a trip, and them paying higher rates. We at CAC maintain our rates at levels of exceptional value by keeping our overhead and operating costs low and our marketing targeted to defined areas that have historically worked for us. We will continue to focus on these specialized markets by providing high quality, personal, private yacht charter services for the discerning adventurer’s and sportsmen and women from across the USA. We are high quality, private, low volume. We don’t need to do trade shows or sportsman’s expositions because we book up every year well in advance of the season with no problem. We are already taking reservations 2 years in advance! Is Classic Alaska Charters a member of Trip Advisor? Absolutely not! We explored the possibilities of becoming a member due to the popularity of the website with other Ketchikan businesses, however, we discovered that Trip Advisor has been plagued by scams and fake reviews often ruining businesses in a fraudulent manner. Business owners themsleves often provide fake positive reviews, or, family and friends write up glowing testimonials to bump up the ratings on the business. CAC wants no part of Trip Advisor and recommends extreme caution to those that unwittingly rely on Trip Advisor reviews to make important travel decisions. For more information visit these websites and decide for yourself: Daily Finance-Trip Advisor A Big Joke, Trip Advisor Watch, Frommer’s Caution on Using Trip Advisor, Beat of Hawaii-Trip Advisor-Hotel Reviews Now A Complete Mess! Does Classic Alaska Charters have Reviews, Testimonials, References? We have a long list… Ask Captain Rob for references, previous guests that have been adventuring with CAC more than once and happy to share their experiences directly with you. No fake reviews negative or positive, just the truth straight from our clients.